Hey, y'all! Monday may bring us back to work, but it also brings us one of my favorite memes and it's all about sharing memories! Y'all know how much I appreciate memories so you can imagine how excited I was to hear of a meme all about writing our memories! I am a full week behind but am having trouble with last week's prompt: The Most Influential Person. Nevertheless, I'm moving forward with this week's prompt and will continue struggling with working on the last one. 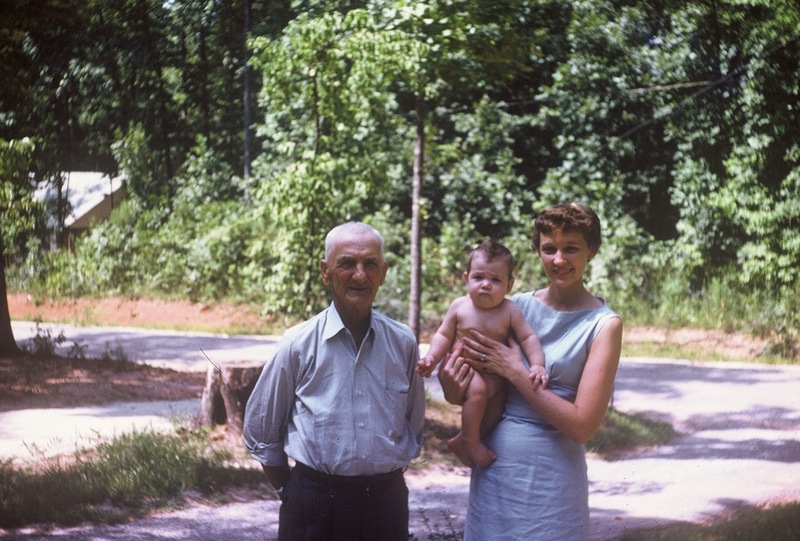 Mother was the youngest of two daughters born to the BEST grandparents IN THE WORLD. She was an athlete (basketball), a cheerleader, extremely social and a dare devil. As the stories go, all someone had to do was utter the words, "I dare you.." and Mother would take up the challenge. 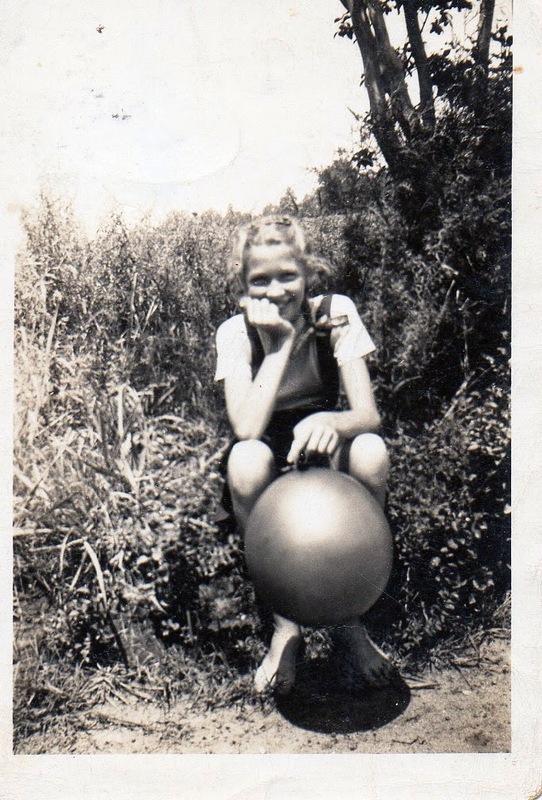 This is one of my favorite pictures of Mother. LOVE the bare feet. 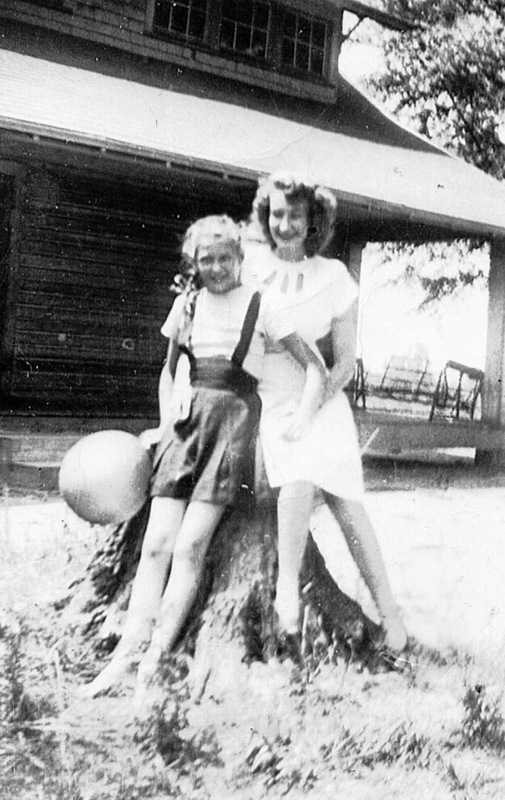 Mother and her sister, my Aunt Betty (whom you won't see with bare feet). That's the house my Granddaddy grew up in in the background. 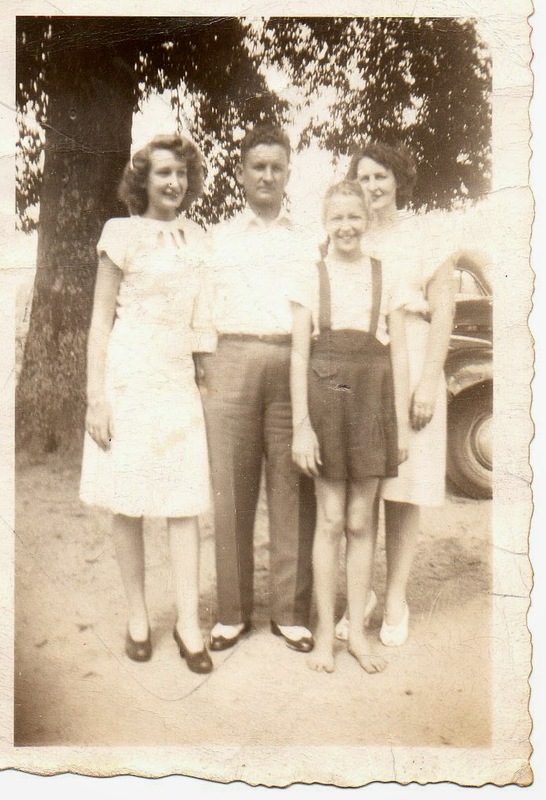 Aunt Betty, Granddaddy, Mother, Grandmother. Please notice Mother's feet. 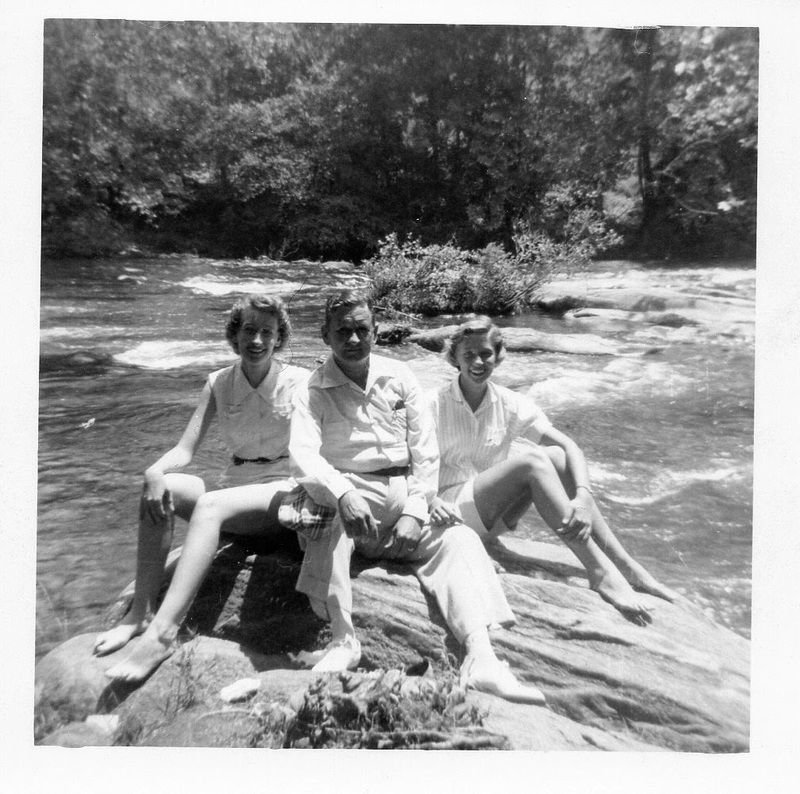 Aunt Betty and Mother with Granddaddy at Lake Lure. Where I'm taking the lovelies for a vacay after Christmas this year. 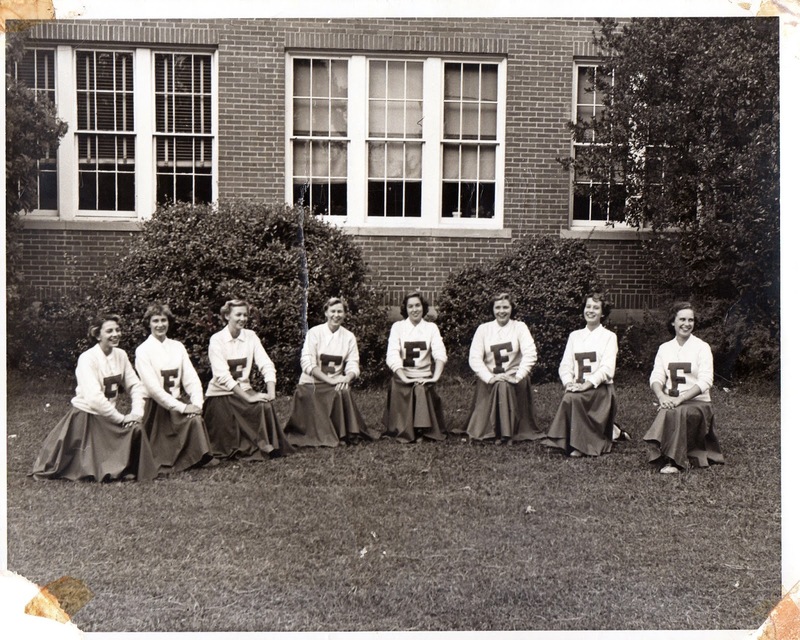 Mother is third from the left. I think this is her senior picture. 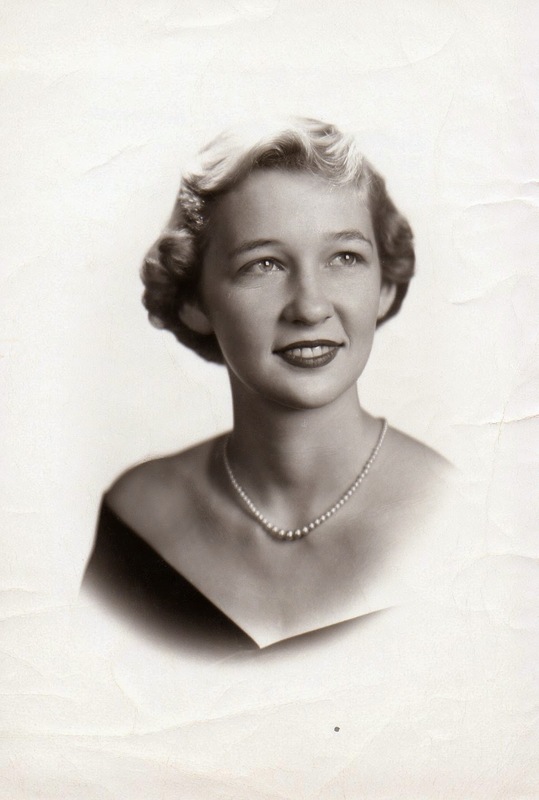 My mom, whom I call Mother, is a very smart and talented person. There are few things that she cannot do or figure out how to do. 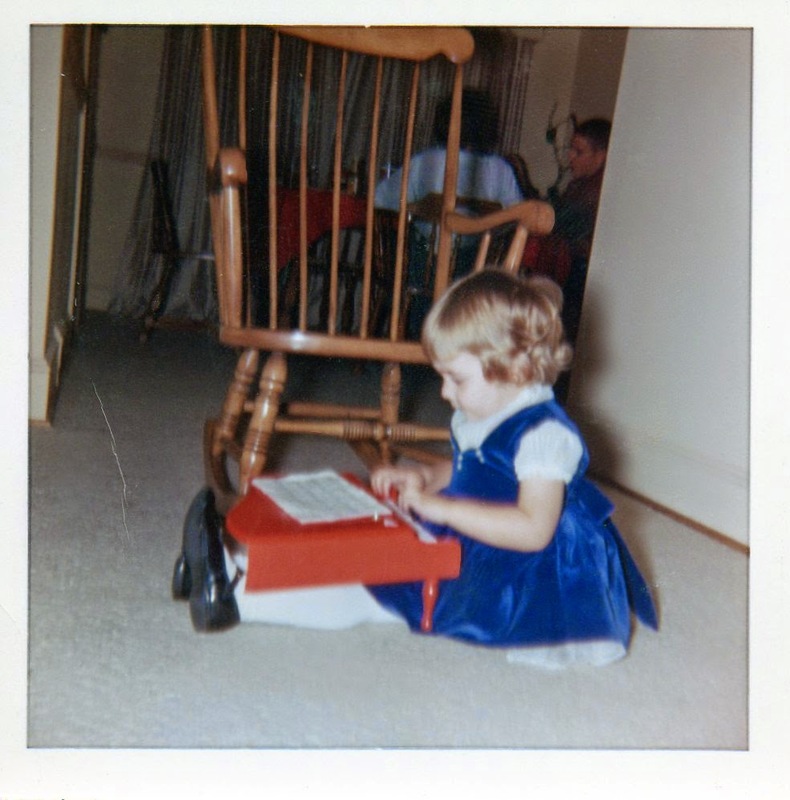 She is a seamstress extraordinaire who made most of her clothes while growing up. She not only designed but made her own wedding gown and her bridesmaids' dresses. She also made a pattern and the wedding gown of my oldest daughter from a picture my daughter drew. 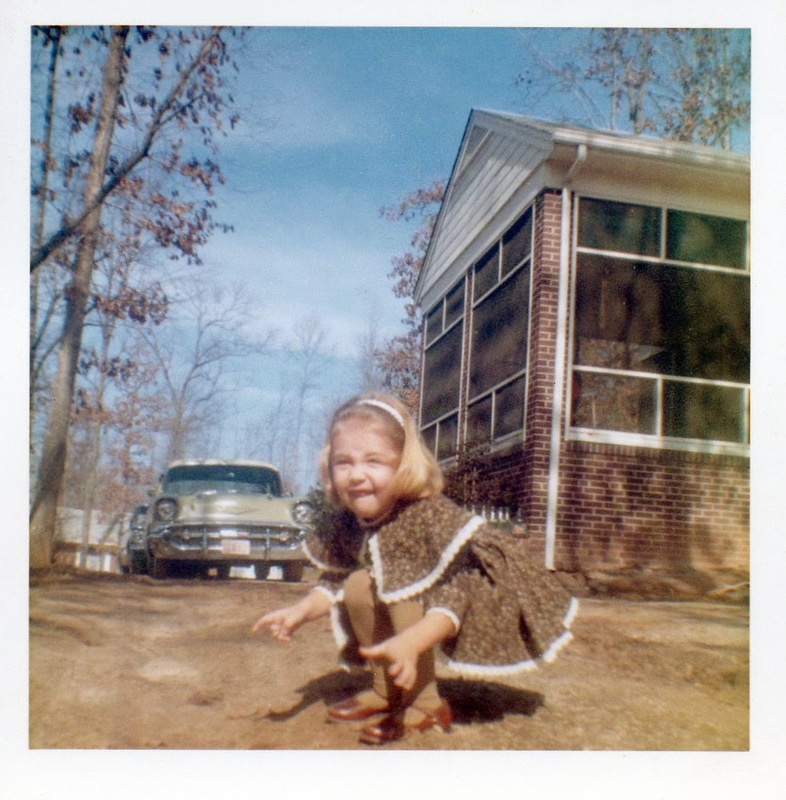 Over the years, Mother taught herself how to knit, smock and quilt. She made all my clothes when I was a girl and even into my teenage years when I was no longer appreciative of homemade clothing. She always let me decorate the Christmas tree and put all red lights on it because red was my favorite color. And yes, I was a spoiled brat. Christmas was BIG in our family. And this one. AND, I totally remember that one and that Christmas. 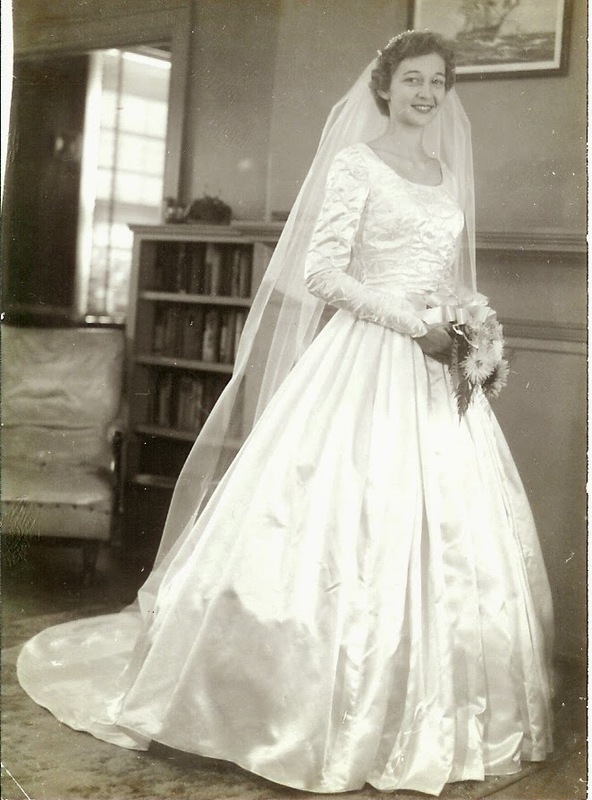 Here's Mother in her wedding gown. She quit college after her sophomore year to marry my dad and had me two years later. When I was in high school, Mother went back to college and was finishing her master's degree in School Psychology when I was in college. She worked as a school psychologist for over 30 years. And, as with everything else, she was really good at it. 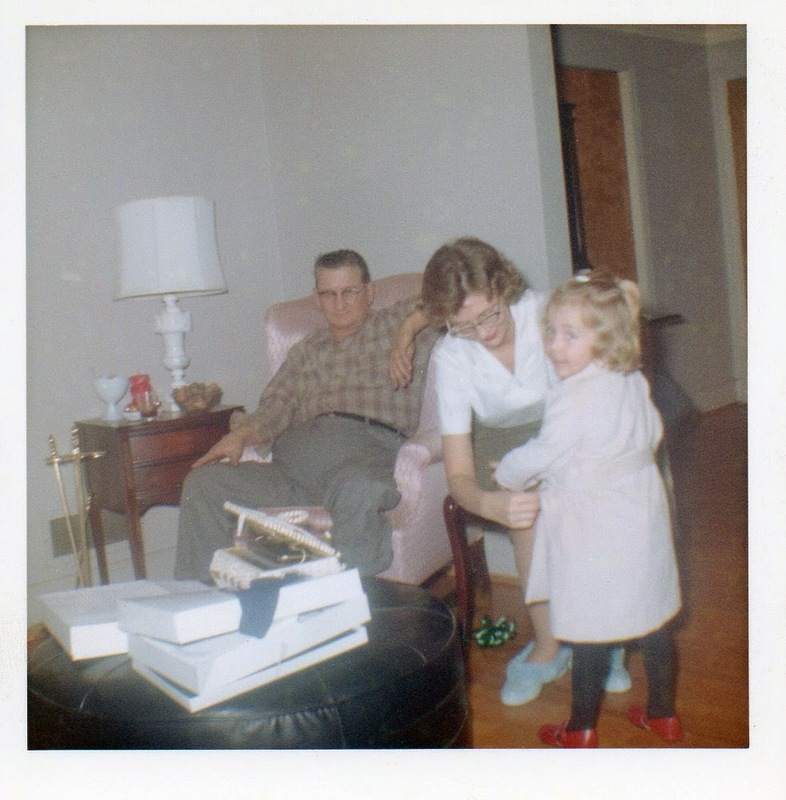 That's me with Mother and her grandfather, Papa Campbell. She was always helpful with the lovelies as they were growing up in a plethora of ways. She has always done many things for many people. The problem lies in the fact that Mother is a control freak. The epitome of a control freak. Look up control freak in the dictionary, and there she is. And this is where all the tension comes into play. BIG tension. BIG. Huge. Ginormous. She is also very good at holding grudges and handing out unsolicited advice. And, to be honest, I'm still uncertain as to how she ended up with those traits. I won't dwell on these things. No one is perfect. It took me a lot of years to make sure that I am not following in the negative parts of those footsteps. And the good outweighed the negative by MILES and MILES. I'm sure I'll keep adding on to this one as more and more stories and memories pop into this old brain of mine. Oh my, what a shame if people "pick up the phone". Good grief. I'm sure your mother is quite aware of her control issues, so it's not going to be a big surprise that you (and others) have caught on. You are obviously proud of her accomplishments, and appreciate all she has done for you and the girls. That's what counts. Shame on the trouble-makers. I'm sure they know who they are, too!! Rock on! Oh, you know how it is. "Can you believe what she wrote? Oh, you didn't read it? Well..." LOL I'm so used to it. Her accomplishments are many. I just wish her motivation was something of which to be proud. I'm with Teri. All she has done for you, her creativity, her gifts and talents. Glad you have learned from her the things not to do!! The list is long for sure! No mother is perfect. Mine is a perfectionist and I gave up trying to be perfect a long time ago. Glad you could join in today. Mine is a perfectionist also. I am not. Well, not exactly. LOL Thanks! Oh goodness, well, I hope there were not any tattle talers!! because honestly, I don't think any of us, not matter how much we love our moms, would say they were absolutely perfect. My mom is a perfectionist: in her mind - Oh yes there is a right way to do things and let me show you!!! LOL But, it's just one aspect of her otherwise loving and fun personality. And often, if it makes her happy to show people those things and do things for them? who am I to steal her joy. It's fine unless it gets tangled up with negativity and trying to force people to do things their way. That's where the mess starts in our situation. The fun parts are intermingled in there somewhere. But the controlling part is overbearing. It just gets old for everyone. The tattlers will either tell or not. I'm used to it. LOL Thanks! Lord knows my Mother drives me crazy and has stirred up trouble over the years but she raised 5 kids that turned out pretty darn good and kept our home clean, cooked every day and did the best she could given that she was never really happy! As she approaches 90 I try to have more patience with her but that's not easy. Your Mom sounds like a very intelligent and hard working woman. She was beautiful in her youth! Cherish the better memories and don't dwell on the not so good ones I say. That's what I try to do, my friend. I suppose they do. And, I just might be one of them. ;) Love you right back!